Eating gluten free at Christmas is not as complicated as you think! So are you hosting Christmas this year and one of your guests is gluten free? Are you ready to give them a great Christmas so they don’t feel left out or different? Do you feel like you haven’t a clue where to start? What does gluten free even mean? I am here to help you! The easiest way to remember what grains to avoid is BROW: Barley, Rye, Oats and Wheat. Technically Oats do not contain gluten but they are milled with the other gluten grains so they can become contaminated. You can now buy gluten free Oats and Oatcakes which can solve that problem very easily. What about the other three? Where might you find them and what alternatives are there? 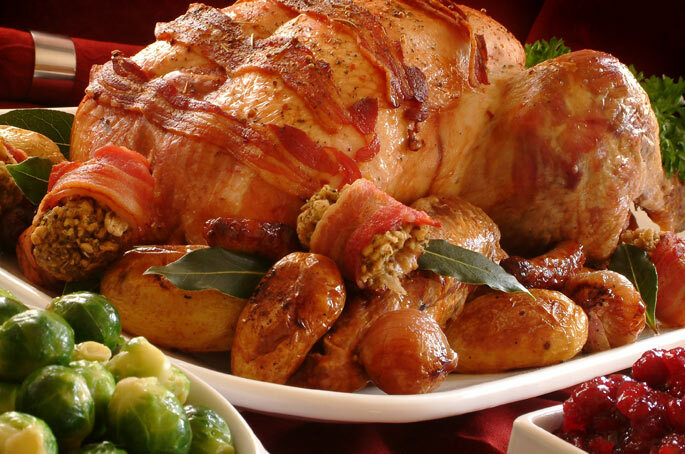 Let’s work through the traditional Christmas lunch and where they might be lurking. Vegetables – potatoes, parsnips, carrots, sprouts, peas, cabbage, broccoli etc. Pigs in blankets: there will be rusk in the sausages. Buy gluten free chipolatas or cocktail sausages and wrap with streaky bacon. Cocktail sausages: will contain rusk and now can be found gluten free. Stuffing: this will be made from wheat breadcrumbs. Hale and Hearty make a gluten free stuffing and Waitrose sell a chestnut, onion and thyme sausage meat stuffing. Gravy: gravy granules and flour both contain gluten. Use cornflour or a gluten-free plain flour instead. Bread sauce: the main ingredient contains gluten and this could be made with gluten-free bread. Yorkshire puddings: contains wheat flour. I have never had much success making gluten free Yorkshire puddings because they end up with a cake consistency that doesn’t seem worth the effort. You can of course use gluten-free plain flour (Doves Farm make a good one) and give it a try. Christmas pudding: there will be wheat flour in it. Gluten free versions are in abundance in the supermarkets as are Christmas cakes. Use a custard made with cornflour or just have the brandy butter. Mince pies: the pastry is made of wheat flour. These are now widely available gluten free. Crackers for cheese: All crackers contain gluten from flour. Nairns Gluten-free oat cakes are lovely with cheese. You could be a bit different and try the Inspiral raw crackits that come in a variety of flavours: Garlic, herb, tomato and wasabi. They are gluten free, raw, vegan and organic. They taste delicious! Chocolates: in general chocolate should be gluten free, however, manufacturers sometimes use flour as an anti-caking agent so make sure you read the ingredients. I prefer some 70 to 85% dark chocolate which is dairy and gluten free and much lower in sugar than the milk varieties. For a special treat try Booja Booja Hazelnut Crunch Truffles. These are gluten and dairy free. Alcohol: many beers contain barley and wheat. Whiskey may contain wheat, rye or barley. I hope this has helped you with your Christmas Day preparations!